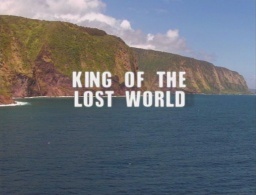 The rest of the film has nothing in common with The Lost World. 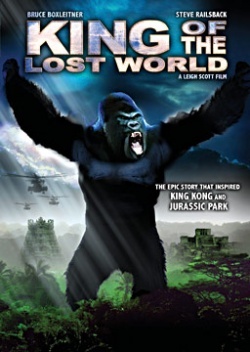 It is more a remake of King-Kong. 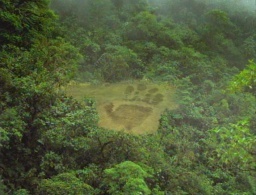 A plane crashes in a remote jungle. Many survive, but the cockpit and the front end of the plane are nowhere to be found. The only way to call for help is to find the cockpit and radio a message. Ed Malone (Jeff Denton) climbs a small hill and he sees the cockpit in the distance about a mile away. A group of people decide to leave the plane and head over to find the radio. John Roxton (Rhett Giles) leads a small group through the jungle. The rest of the passengers stay put in case a plane passes by. The group arrives at the fuselage when they notice that it's not the same plane they flew in. In addition, the radio and all other important instruments have been stripped and taken away. They are startled by the arrival of Lieutenant Colonel Challenger (Bruce Boxleitner), who managed to travel by himself all alone to the downed plane, still carrying a briefcase that he doesn't seem to want to part with. The group continues to look for the cockpit with some of their group getting killed or lost along the way. They then encounter a military plane, which Challenger tries to turn one of the missiles into a flare gun, but fails. The group stops at a cavern for the night, where they are attacked by giant scorpions. John and Tianka are killed, whilst a desperate Ed, Challenger, Rita, Dana, and Natalie flee for safety. As they escape from the stream, they are captured by a group of natives living in the pateau. It is soon learned that the natives have been stripping the airplanes to avoid any outside interference. The natives also turn out to be other people that had crashed a long time ago, and have developed a sacrificial rite to appease the creatures of the jungle. Dane and Natalie are both brainwashed into joining them, while Ed is chosen as the sacrifice. However the sacrificial ceremony fails when a giant ape attacks the area, while Dana (who faked being brainwashed) saves Ed. They then meet up with Challenger and Rita, when they spot military jets flying overhead who attack the giant ape, but are destroyed in the process. Challenger is then killed by a native, leaving Ed alone to try and defeat the ape. This page was last edited on 30 July 2015, at 22:39.